Personalized on 2 lines, up to 20 characters each. Just insert the bag that comes with your wine, or fill the beverage bag that is included. can you have the bag filled at growler stations? BEST ANSWER: We do not see anything wrong with you filling this up at growler stations. 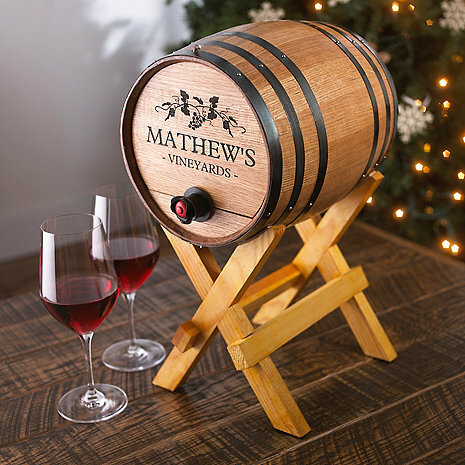 BEST ANSWER: The Personalized Boxed Wine Barrel Dispenser is only offered with the design shown on our website. Are these dimensions correct....this item holds 5 liters and is 20 inches from front to back? At its widest it is only 8 inches? BEST ANSWER: I am not exactly sure because we gave it as a gift to my parents...but they love it and use it all the time! We had it personalized for them as well. Whatever the catalog references would be the dimensions. how many liters does this barrel hold? Does the stand come with the barrel? Do you only make 3 L barrels?